Well, I have been wanting to update since the game, but haven’t found the time! It ws soooooooo much fun! 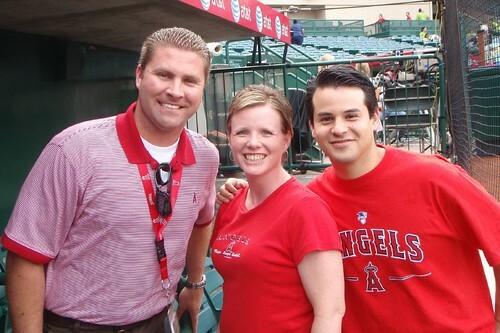 We were able to connect with Brian at Angel’s Stadium, and he took us (Sol, myself, Bianca and Jeremy) on a tour of places we’ll never get to sit! It was really fun! We went down and saw the underground batting cages, the doors of where the owner sits, and the Dugout Seats where we watched batting practice from! We even touched the dirt!!! 🙂 The game itself was a lot of fun, too! We stayed all 12 innings and the score kept going back and forth with the Angel’s losing 10-7. Some football scores aren’t that high! 🙂 Not only was everything paid for (from parking to food), but during the game our entire section won $5 gift certifcates to Claim Jumpers Restaurant! I was even given a ball signed by Vladimir Guerrero! How cool is that?!? it was such a fun time and we were extremely blessed by the Angel’s organization (and Shelley and Lore who, with their daughters, watched Kai). Thank you Patty, Shelley, Lore and Brian for making this happen for us! We are so thankful! Sea World…Kai and I went with Sunshine and Madison to Sea World on Thursday! It was so much fun! Kai was in such a great mood and loved every single minute we were there! He was so interactive with the shows and even was clapping and cheering for Shamu to splash everyone! 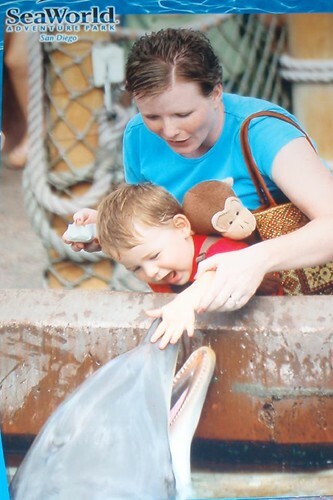 He loved feeding and petting the dolphins and bat rays, as well as seeing the sea lions, otters, penguins, polar bears, baluga whales and all the fish! He was captivated by it all and will tell you all about it (complete with hand motions) if you ask him! It was a great day and I am so thankful for feeling well enough to spend such quality time with him exploring the world of the oceans! It was a precious gift to share that day with him. Tonight I had a girls movie night with Laura and Dawn, and we saw “The Sisterhood of the Traveling Pants 2”. Laura and I had seen the first one together as well. Cute movie and a fun night of popcorn, soda, peanut M & Ms and a chick flick…my favorite things! Thank you so much for praying that the bone pain would go away. I felt pretty good both days and was able to really enjoy them fully! Please pray as next week approaches that my white blood cell count would be high enough that they would be able to give me chemo and not have to give me any shots afterwards! Wouldn’t that be wonderful! I hope this finds you all well and enjoying time with your own families and friends!